(CNN) -- An estimated 95 percent of Louisiana's 2 million coastal residents had fled ahead of Hurricane Gustav by Sunday evening in the largest evacuation in state history, Louisiana's governor said. 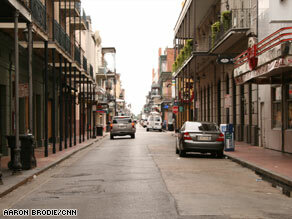 The streets of the French Quarter in New Orleans clear out as residents evacuate in anticipation of Hurricane Gustav. More than 200,000 people have left New Orleans, leaving an estimated 10,000 people in the city Sunday night, Gov. Bobby Jindal said, citing New Orleans' police chief. New Orleans Mayor Ray Nagin had demanded an evacuation of the city, which still is recovering from 2005's Hurricane Katrina. Forecasters warned Gustav -- a Category 3 storm Sunday night -- could hit Louisiana with devastating effect late Monday morning or early Monday afternoon. Jindal said New Orleans' levees should "barely hold or barely be overtopped" if the storm, as predicted Sunday evening, hit southwest of the city. On Sunday night, road, rail and air links out of New Orleans began to close ahead of Gustav, which was sweeping toward the Gulf Coast with 115-mph winds. At 8 p.m. ET, Gustav was about 260 miles south-southeast of New Orleans, the National Hurricane Center in Miami, Florida, reported. The storm was moving across the central Gulf of Mexico at 17 mph. Dangerous storm surges of 10 to 14 feet above normal tides are expected near and to the east of Gustav's center, forecasters said. Rain accumulations between 6 to 12 inches are possible over parts of Louisiana, Mississippi and Arkansas, with isolated amounts of up to 20 inches, through Wednesday morning, according to forecasters. Gustav killed at least 51 people in southwestern Haiti and eight in the neighboring Dominican Republic last week before moving to Cuba. It was in the Caribbean on Friday and intensified just before it hit Cuba. In New Orleans, Lt. Col. Jerry Sneed, the city's emergency operations chief, said government agencies had evacuated 18,000 residents who were without transportation. National Guard troops and police were still combing the city late Sunday afternoon, broadcasting evacuation messages in English, Vietnamese and Spanish, Jindal said. Jindal said the New Orleans area had finished evacuating homebound and nursing home patients by 7 p.m. ET Sunday, and 73 critical-care patients deemed OK to move still were in the process of being moved out of the area.Some critical-care patients had to stay at medical facilities. Eighty patients remained Sunday evening at New Orleans Children's Hospital, more than half of them in a critical care unit. Nurse Crystal Mayeaux says she will not leave them. "We are attached to all the babies here, she says. "They know us. "The last flights out of the city's airport were slated to take off Sunday evening, and highways out of town were packed all day with evacuees from Louisiana and Mississippi. "It was bumper-to-bumper for about 10 hours trying to get out," said Roberto Ascencio, a restaurant owner in the New Orleans suburb of Gretna. He said he, his wife and daughter packed their pets and whatever else would fit in their car and headed east on Interstate 10 as Gustav neared. "Anybody who's caught looting in the city of New Orleans will go directly to Angola [Louisiana State Penitentiary]. You will not have a temporary stay in the city. You go directly to the big house, in general population," he said. The storm altered plans for the Republican National Convention, which is scheduled to run from Monday through Thursday in St. Paul, Minnesota. Rick Davis, campaign manager for presumptive GOP presidential nominee John McCain, said Monday's session would run only from 3 to 5:30 p.m. CT, and will include only activities that are necessary to launch the event. "Owing to the fact that [McCain] has asked us to take our Republican hats off and put our American hats on, tomorrow's program will be business only, and we'll refrain from any political rhetoric that would be traditional in an opening session of a convention," Davis said. Convention plans for the rest of the week will be made as the storm is assessed, he said. Earlier Sunday, President Bush said he would forgo an appearance at the convention on Monday to go to Texas to meet with emergency workers and evacuees. He urged Gulf Coast residents to get out of the storm's path. "This storm is dangerous," Bush warned after a briefing at FEMA headquarters, urging residents to heed calls to evacuate. Also Sunday, a federally supported computer projection says Gustav could cause up to $29.3 billion in property damage when it hits the Gulf Coast. The software, developed by FEMA and the National Institute of Building Sciences, also projected Sunday that 4.5 million people will be in the storm's path and 59,953 buildings will be destroyed. The path also ensnares about 170 hospitals and more than 1,100 police and fire stations. State, local and federal officials urged residents across the region to flee. Charter flights, paid for with federal funds, carried thousands of evacuees to other Southern cities, including Knoxville, Nashville and Memphis in Tennessee. The air evacuation was part of a detailed plan developed in response to criticism after Katrina's chaos. Katrina, a Category 3 storm, flooded most of New Orleans, flattened beach towns in Mississippi and killed more than 1,800 people. Maps of Gustav's path show that it could strike southern Louisiana and other areas battered by Hurricanes Katrina and Rita in 2005. Mississippi Gov. Haley Barbour said government agencies were "10 times better prepared" than before -- but "that doesn't mean everything is going to go right," he said. "Anybody who thinks everything is going to go perfect just doesn't know what they're talking about," Barbour said.